Injuries to the head and brain are the most common cause of death in motorcycle accidents. Just because you wear a helmet does not make you immune from a head injury. According to an October 2009 study conducted by the National Highway Traffic Safety Administration (NHTSA), in the motorcycle accidents studied, 20 percent of motorcyclists without helmets suffered a head injury, and 12 percent of helmeted cyclists suffered a head injury. While the majority of motorcycle accident injuries that resulted in hospital treatment involved the extremities, more than 15 percent involved head injuries. Auger and Auger is a full-service law firm representing clients with traumatic head injuries from motorcycle accidents. Also called TBI, traumatic brain injury occurs when the head is hit or shaken so violently that the brain is moved inside of the skull. It can result in the accumulation of blood or swelling around the brain, leading to pressure on the brain, which can bruise or permanently injure the brain tissue. Symptoms can include dizziness, nausea, vomiting, headache, difficulty with word-finding, lethargy, combativeness, and poor concentration. People who suffer TBI can also develop mental health issues, such as depression and excessive anger. More serious symptoms include loss of consciousness and coma. Most skull fractures (69 percent) are linear skull fractures. In this type of fracture, brain tissue is not penetrated. While most linear fractures are considered minor, there are significant complications which can arise, including leakage of cerebrospinal fluid and damage to blood vessels. A depressed skull fracture can occur from a particularly violent impact and results in fragments of the skull penetrating or pushing on the brain and can result in significant brain damage. Many victims of open head injuries will require immediate surgery to stop the bleeding and allow room for swelling. Removal of bone fragments can lead to later implantation of harvested bone to protect the brain. When brain tissue dies or is destroyed, the brain does not regrow new cells. Other parts of the brain may compensate for the lost tissue, but they will not regenerate. Even if you think your injury is mild, symptoms can become more pronounced over time and have a profound effect on your family as well. In fact, since symptoms might not be obvious at the time of the wreck, your family members can be instrumental in identifying cognitive and mental impairment. The biggest mistake that motorcycle accident victims make is talking to the insurance company before speaking with an experienced injury attorney. 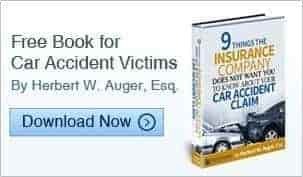 Insurance adjusters are trained to try to get you to admit partial fault or make a statement indicating that you contributed in any way, no matter how slightly, to the accident. They will also try to get you to minimize your injuries. The will immediately begin their own investigation, and it will be focused on trying to find you partially at fault or with less severe injuries than you may actually have. Some insurance companies will even show up on your doorstop the day after your accident, offering you a monetary settlement. This is before you even know the extent of your injuries! And if in a moment of vulnerability, you accept that settlement, your case is over immediately, and you will not get a penny more – ever. For these reasons, it is critical that before speaking with any insurance company, that you speak with a motorcycle accident lawyer. At Auger & Auger, we will immediately conduct an investigation of our own. We will make sure you get the medical treatment you need, even if you are not covered by health insurance. When you call Auger and Auger, your confidential consultation is free, and when retained to handle your case, we do not charge a legal fee unless we obtain a monetary settlement on your behalf. There is no obligation, so call today for your free consultation.